To our newest brothers, welcome! This summer, you undertook a great journey as you attended your Order of the Arrow Ordeal. Before this, you may have been well aware of the OA – Scouting’s National Honor Society – and the challenge, meaning, and symbolism involved in the Ordeal. Perhaps your father, mother, older brother, or friend in the troop went through and you had heard all about the experience. Our History | The Order was begun in 1915 outside of Philadelphia. For over the past 100 years, the OA has been made up of the best and brightest in Scouting. You should be proud that the Scouts in your unit see you as being one who lives the Scout Oath and Law in your daily life. However, the OA is not an award one earns like Eagle Scout; rather, it is a call for a life of cheerful service to others. Ø Sleep Alone | On Thursday night, the candidates slept alone on their groundsheet underneath the stars (actually, not 20 feet away from anyone else, but in the dark night, they didn’t know that). This challenges the candidates to be “steadfast as the polestar, self-reliant and undiscouraged”. Ø Scant Food | During Friday, both the breakfast and lunch meals were smaller than a typical meal. Through this form of fasting, sacrifice, and self-denial, we learn that “a cheerful heart is lively…under hardship”. Ø Arduous Labor | On Friday, the day spent working in cheerful service of the camp is consistent with the Order’s purpose of seeking to serve and “being faithful to the high ideals of the Order of the Arrow”. What’s Next? #1 | The first place you can get involved is by attending your Chapter’s monthly meeting. Here, you will be able to take part in a lot of fun activities, meet Scouts from other units in the District, and get involved in the fun program of the Order of the Arrow. Chapter meetings are typically held each month in conjunction with district roundtable meetings, but check the lodge website (www.akk185.org ) and with your Scoutmaster for specific times and locations. For more information on your Chapter, please look at the Chapters tab on the lodge website. What’s Next? #2 | Completing the Ordeal is just the first step in one’s path as a member of the Order of the Arrow. Next year (after at least ten months as an Arrowman), you should seal your membership in the OA by becoming a Brotherhood member. We will be offering Brotherhood classes and resources throughout the year and occasionally at Chapter meetings. Information will be in the lodge newsletter, The Little Carpenter. You can start studying now by visiting our website and looking at the Get Your Bars Brochure (http://s3-us-east-2.amazonaws.com/akk185-data/2014/04/09204055/Get-Your-Bars-Brochure.pdf). Fall Fellowship | Nothing but fun, spirit, competitions, big plates of awesome food, and of course…fellowship with Arrowmen from all around the Blue Ridge Council! The date for this is November 17-19, 2017 at Camp Old Indian. For more information and/or to register for any lodge event, go to www.akk185.org or contact your Chapter Chief or Chapter Adviser. Lastly, you should know that the OA, like the Troop, is youth-run; young men are able to take on District and Council leadership roles beyond their units. Each District’s OA Chapter has a youth Chapter Chief and as Lodge Chief, I am one of two youth Scouting members (the other is the Council Venturing President) that sit on the Council’s Executive Board. You can even climb to heights beyond that such as on the Area and National levels. 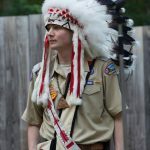 For example, I have served as a Section Chief, leading the Southern Region’s Area 5 (Scouts in GA, SC, and NC) as well as on the National level as a National Jamboree Vice Chief. If you need to be convinced of how life-changing the OA can be, you can just talk to me! If it were not for the OA, I can confidently say I would not have continued through Troop 159 and strived to become an Eagle Scout. The OA makes the difference! We are pleased to welcome you into our brotherhood!